The Contour data class consists of linear segments that connect contiguous points of the same elevation that are compiled and used to describe terrain relief. 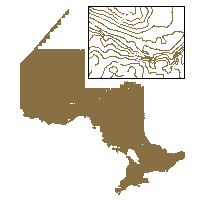 Includes: Contour Land Contour Land Approximate Contour Land Auxiliary/Interpolated Contour Land Depression In southern Ontario the contour interval is 5 meters. In the near north the contour interval is 10 meters. In the far north the contour interval varies dependent on the source of the information. This layer is part of what was known as the OMNR Fundamental Dataset. To identify the following types of contours: contour land, contour land approximate, contour land auxiliary/interpolated and, contour land depression.